As I suggested in previous writings on Rhum Barbancourt and El Dorado, perhaps nothing is as calming as kicking back with a fine sipping rum and a well-paired cigar. 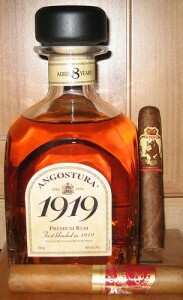 And, for my money, perhaps no rum on the face of the Earth is quite as relaxing as Angostura 1919. Oddly enough, this Trinidad & Tobago-based company is better known for its aromatic bitters—highly concentrated food and beverage flavorings—than its rum. Angostura’s beginnings can be traced back to 1824 when a surgeon general in Simón Bolívar’s Venezuelan army sought to improve the appetite and digestive well-being of the soldiers. It wasn’t until 1947 that Angostura began to ferment, distill, age, blend, and bottle rum in Laventille, Trinidad. According to the company’s history, today Angostura produces over 600,000 cases of rum each year, most of which is shipped to America, Great Britain, and other islands in the Caribbean. Angostura 1919 is an “añejo made from a blend of light and heavy molasses-based rums aged for a minimum of eight years in charred American oak bourbon barrels.” I picked up a 750 ml. bottle (40% alcohol) for $28. With its square-ish (dare I say box-pressed?) shape, protruding black cork, and golden clarity, the bottle jumps out at you as you walk down the rum aisle. I find the flavor to be sweet and spicy on the nose with a dry profile that includes caramel, vanilla, and toast. The long, smooth finish opens up after a few seconds to reveal a soothing, rounded heat. This rum’s subtle complexity can be overshadowed by most full-bodied cigars, so my pairing recommendation is to stick with something in the medium-bodied range. A few winning combinations include La Aurora 1495, CAO L’Anniversaire Cameroon, and Hoyo de Monterrey Epicure. For the blend’s reserved density, though, perhaps the best complementary match I found is with a Cuban Crafters Medina 1959. I’ll end by noting that Angostura also offers an 1824 blend of more mature rums at a cost of about $55 per 750 ml. bottle (40% alcohol). I look forward to trying that out and reporting back to you. Meanwhile, don’t be afraid to purchase a bottle of 1919; it is affordable and definitely tasty enough to sip neat or on the rocks. How would this go with a don kiki brown? Is it too full bodied? Yes, I think the Don Kiki Brown Label's full flavors would drown out the softer, more delicate notes of this rum. I'd try a Green or White label instead.